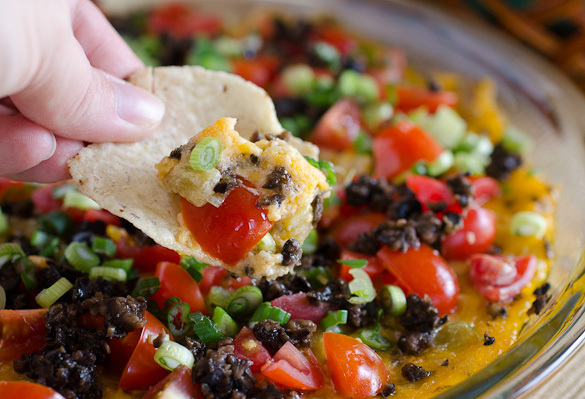 Baked Southwestern Chile Dip is a super easy dip that can be prepped up to 4 hours in advance. 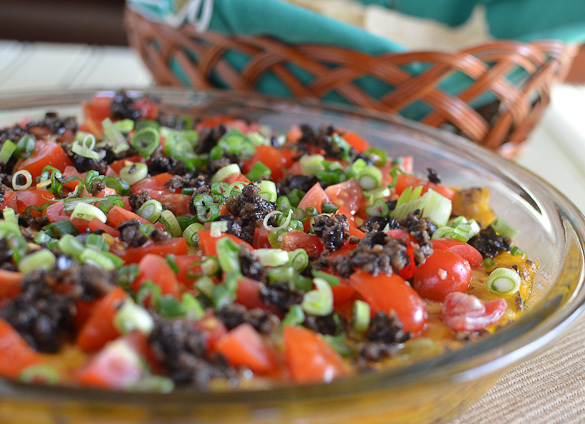 Throw in the oven for only 20 minutes before topping with fresh tomatoes and green onions. Super Bowl Sunday (aka this year The Brother Bowl, or The HarBowl) is less than a week away! Yipeeee! It’s one of our favorite “holidays.” (Are we the only ones who consider it a holiday?) 🙂 Ben grew up near Baltimore, so I don’t have to tell you who we are rooting for, although we’re ultimately Chicago Bears fans. But, you already knew that, right? This year, we are hosting the party and I plan to figure out how to socialize, eat AND watch the game all at the same time. 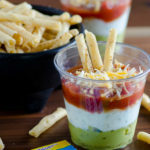 Plus, I have a few new appetizers already up my sleeve that can be prepped ahead of time so I don’t need to spend all of my time in the kitchen. 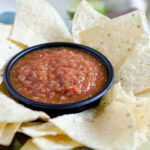 This one is a super easy dip that can be prepped up to 4 hours in advance, then thrown in the oven for just 20-30 minutes before topping with fresh tomatoes and green onions. My friend from church served this at a women’s gathering a few months ago and I tracked her down for the recipe right away. I believe it may have originally come from a Better Homes and Garden publication, but not entirely sure. Either way, it’s a keeper! Combine the cheese, mayonnaise, three-quarters of the olives, chiles, garlic powder and hot sauce in a large bowl. Stir until evenly blended. Spread into a lightly greased 9-inch pie plate or small baking dish. (At this point, you can cover the dish with plastic wrap and refrigerate up to 4 hours. Bake as directed, increasing baking time). Bake at 350 degrees F for 20 minutes or until heated through. Sprinkle the tomatoes, remaining olives, and green onions evenly on top. Serve warm with chips, peppers, crackers, crusty bread, etc. 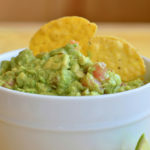 Dips and the Super Bowl go hand-in-hand! This one looks like cheesy goodness! i’m glad you tracked down this recipe. looks delicious! 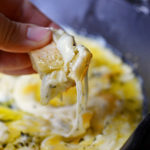 I was looking for some new dip recipes and this is perfect! I could eat this all day!! 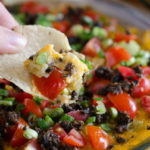 It’s fantastic to see The Southwestern Chili Dip here on your blog. I was given a very similar recipe @ 20+ years ago from a friend who was a great cook. My family has enjoyed it ever since. This is a go to recipe for an appetizer that everyone will enjoy. It’s a real crowd pleaser.